With spam callers increasingly becoming an issue all over the world, India set out to tackle the problem by implementing a “Do Not Disturb” app that could let users report spam numbers and register to a ‘do not call’ registry so that Indian subscribers can see relief from constant telemarketing calls. The TRAI DND app works by letting users report phone numbers that make spam calls or SMS, although it eventually depends upon the carriers to take any action on those numbers (which rarely happens). 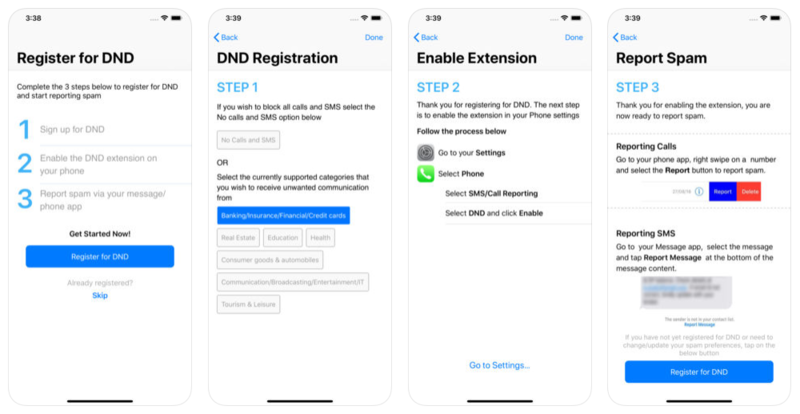 Apple and TRAI were in battle earlier this year, with TRAI (Telecom Regulatory Authority of India) demanding Apple allow its DND app on the App Store. The app required access to the user’s call logs and SMS, which is against App Store policies. Apple, thus, declined to have the app on the store, which threw TRAI in a hissy fit and repeatedly threaten to ban sales of iPhones in India. (Google, meanwhile, allowed the app on the Play Store.) This was back in July. By August, things had settled down a bit, and TRAI said they will be taking advantage of the new feature in iOS 12 that allowed users to report spam calls and messages. TRAI finally released its app this week that uses this feature, without accessing any private data. iPhone users in India can find the TRAI-DND app now at the App Store. In order to install the app, you must have the latest version of iOS 12.1 installed.